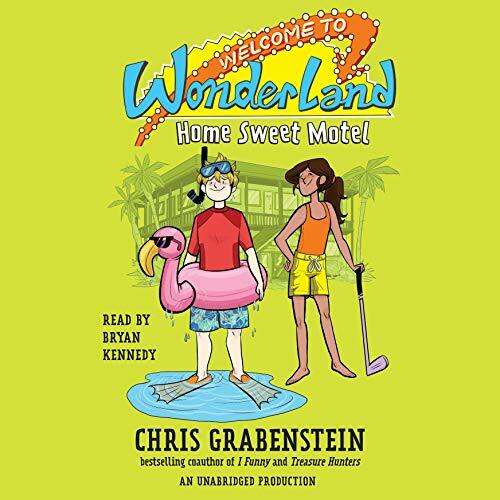 From Chris Grabenstein, the best-selling author of Escape from Mr. Lemoncello's Library and coauthor with James Patterson of I Funny, House of Robots, and Treasure Hunters, comes a hilarious series about all the wacky things that happen when you live in a motel! Eleven-year-old P. T. Wilkie may be the greatest storyteller alive. But he knows one thing for a fact: The Wonderland Motel is the best place a kid could ever live! All-you-can-eat poolside ice cream! A snack machine in the living room! A frog slide! A giant rampaging alligator! (Okay, that last one may or may not be made up.) There's only one thing the Wonderland doesn't have, though: customers. And if the Wonderland doesn't get them soon, P.T. and his friend Gloria may have to say good-bye to their beloved motel forever. They need to think big. They need to think bold. They need an outrageous plan. Luckily for them Gloria is a business genius, and outrageous is practically P. T.'s middle name. With Gloria's smarts and P. T.'s world-famous stories and schemes, there's got to be a way to save the Wonderland! Cute story. My boys really enjoyed it, and so did I. We will be looking for the rest of the books! loved it! it was very interesting and very funny as well. I recommend this for you! Loved the cris grabenstine book overall amazing!!!!!!!!! Can’t wait to listen to the next audiobook! !